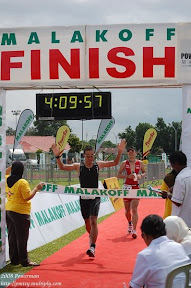 Pictures was from Hj Untong Hj Nordin and was also copied from Hj Ariffin Hj Ajamain’s facebook) – Thank you very much. The race was held on Sunday, 25th October 2009. The flag off was at Sg Liang Recreational Park, Kuala Belait and about 30 cyclists including a few Miri cyclists join the race. It was organized by cyclists for the cyclists and most of the PRO riders come and show their supports by helping. It was a simple happy-go-lucky race and a well organized event. The race started with a race briefing. ……..and the race is ON !!!! After Race Carbo Loading BBQ…………. tak jumpa bro pun masa TNF Singapore? How did u do?